DuPont remains, in our view the preferred way to gain exposure to the potential Dow/DuPont deal. Changes/events since the deal was announced increase the risk that the deal may not happen – in which case DuPont is the safer path. DuPont has more self-help cost related levers to pull and could embark on a unilateral break-up/sales strategy that could add considerable value. Dow would likely underperform because of uncertainty over leadership and what might be the best go-it-alone strategy to follow. 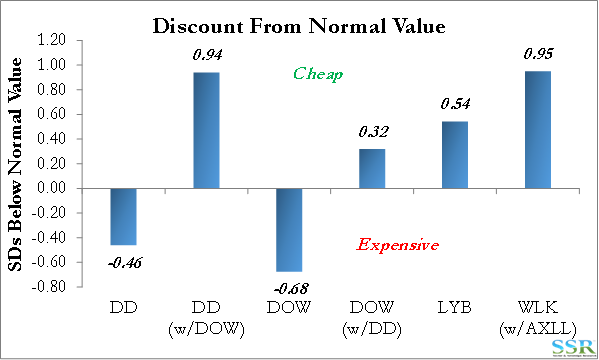 Dow is well run and cost opportunities more limited. Both Dow and DuPont are significant exporters from the US and would probably lose out equally from any major contentious trade initiative from the Trump administration. Both have assets overseas and would see earnings suffer from dollar strength. Neither would be “go-to” names within the space should an aggressive trade war erupt. Dow could benefit independently from greater leverage to a strong and sustained polyethylene cycle, but there are more attractive ways to play this theme. As stated in prior research, we think that 2017 could be a stronger than expected year for polyethylene and that any weakness in 2018 will be short. However, LYB and WLK are much more interesting than a stand-alone DOW on a valuation basis today – Exhibit 1. Both companies have “infrastructure” exposure, but it is a small percentage of sales for both companies. DuPont’s safety and protection business would likely benefit the most. Again, this might make a DD go-it-alone strategy more attractive as this business might sell at a very high premium to DD’s current value in any break-up story. The EU ruling – now expected in December – could be a major catalyst, depending on the size of the divestment the EU requires – this assumes they do not block the deal completely (which we think is unlikely). Both parties have the right to drag this through June 2017 and enforce the break-up fee, but it is possible that circumstances change enough for there to be agreement to walk away. Both companies have done extremely good unilateral jobs of focusing on their core businesses, outperforming the group on both top and bottom line growth – Exhibit 2. The cost focus is apparent at both companies, with Dow showing much more immediate focus than we had expected pre-deal. The competition authorities have taken a much harder look at the merger – focusing on Ag – than perhaps was expected, already pushing out the expected completion date by a quarter. It is not clear that the companies can satisfy the competition authorities and still have a deal that is palatable to both sides – some of the upside will inevitably be given away in forced divestments. Trump! 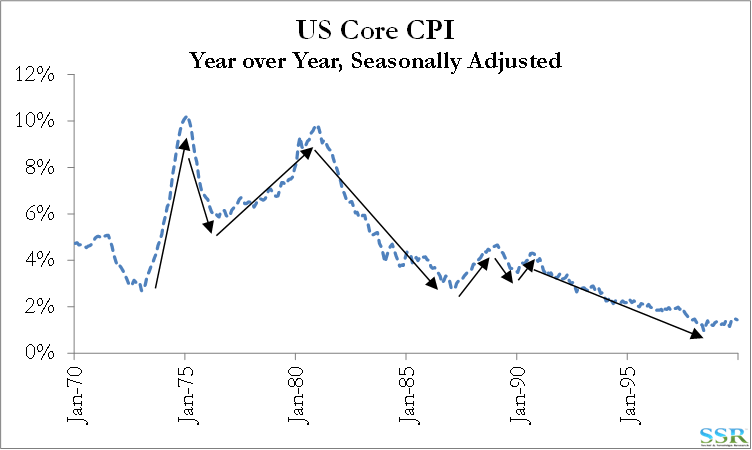 Pro-business, pro-lower corporate taxes, pro-investment in the US and pro trade barriers, much of which will likely drive inflation. Given the new environment and the companies’ own experiences of the last year, while clearly very publicly supporting the deal, it is likely that each leadership team is taking pause right now to consider whether a “go-it-alone” strategy might create more shareholder value, even with the break-up fee. Both companies have found lots of cost to cut, which is not surprising given the exercises they are currently undertaking – during the DD/Chemours split, DD identified redundant costs simply through the process of cost allocation – pockets of cost were identified that neither company wanted and so they were eliminated. As both Dow and DuPont gear up for the merger they are going through a similar exercise – exposing costs that have perhaps gone un-noticed – only because none of the expected surviving entities wants to bear those costs. Both have unilaterally identified and announced cost initiatives pre-deal (DuPont more than Dow), and we would be surprised if neither company had yet more planned – with or without the deal. Here we think DuPont probably has more opportunity than Dow, as Dow was a leaner structure before this all started. However, we have maintained for years that we felt Dow was carrying too much cost in terms of too many employees, chasing a higher “value add” portfolio, requiring a heavier customer touch, that was not delivering enough incremental margin to justify the incremental cost. Accordingly, we believe that, while DD may have the greater opportunity, DOW still has more opportunity left. So, if it was just about costs we believe that DD would be more inclined to break the deal than DOW. Dow stands to gain by sharing in the DD cost opportunity. Ag is where the regulators are focused and seeds specifically, although some subsets of Ag-Chemicals (herbicides) have also raised a red flag. Our take here is that the DuPont business has the better DNA and should be the more profitable and faster growth business. 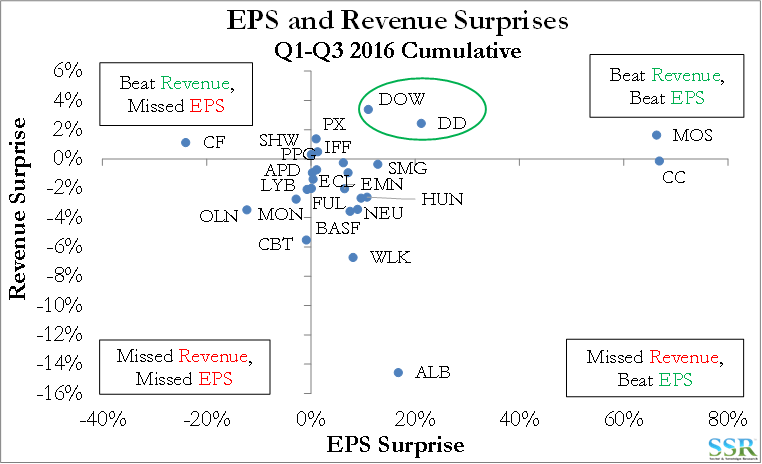 However, Dow has outclassed DD on growth, albeit while spending more, for the last 5 plus years. We put this down to operational and sales execution – far better at Dow than at DuPont. This is counter-intuitively why we like DuPont’s go it alone chances better – because there is a lot to fix and lot to be gained by fixing it. The combination would do that (assuming the regulators allow the deal through), but DuPont can do a lot on its own, while Dow’s business is already very well run and consequently offers less upside. 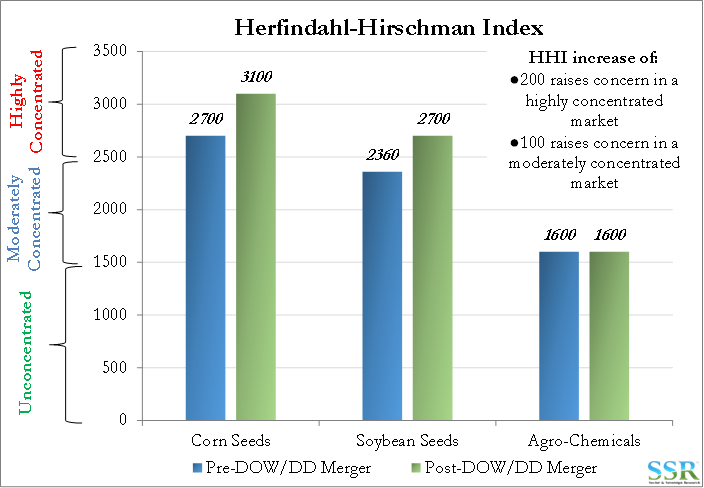 If the merger fails, both companies could look at smaller deals, but the better strategy for Dow might be to try to sell to BASF or spin out the business and the better strategy for DuPont might be either to spin the business or sell everything else leaving Ag as the stub. DuPont more likely to want to break the deal than Dow on this basis. Otherwise we cannot see any material demand growth/weakness views that might make either side look on the deal any differently than they did a year ago. A marginal reason for Dow to want to break the deal. 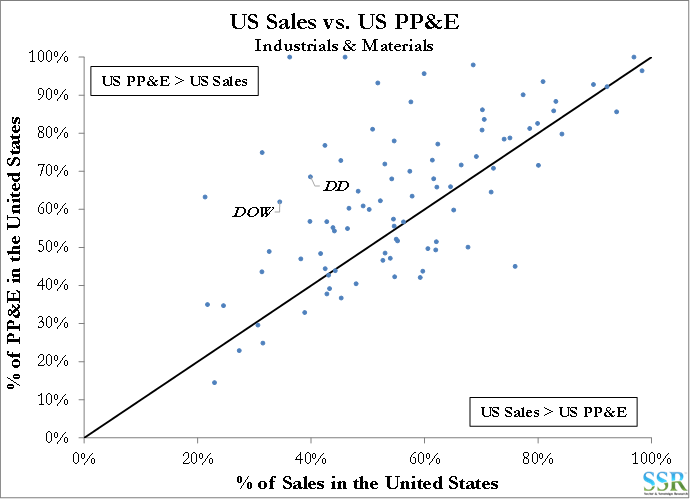 Based on company segment reporting, construction accounts for roughly 5% of DD sales (Performance Materials, Protection Solutions) – equivalent figure for Dow is ~3% (Dow Building & Construction within Infrastructure Solutions). These are not really significant enough to move the needle though there would be follow-on secondary economic effects that would benefit both companies – Dow probably more on a consumer packaging basis in the US, though both might benefit from improved domestic auto/truck sales. Dow has divested the two business that might have the most leverage – chlor-alkali (through PVC) – better exposure through WLK; and styrenics – rubber and carpet backing – better exposed through TSE. No incentive on either side. The chart below implies that both companies export a lot from the US and would likely not do well in a World with more restrictive trade flows – at least initially – Dow could be hurt more if trade barriers create inflation, slow global demand growth and create a commodity chemical overhang. More reason for Dow to want the deal to provide the cost cutting opportunity as an offset to possible commodity weakness. 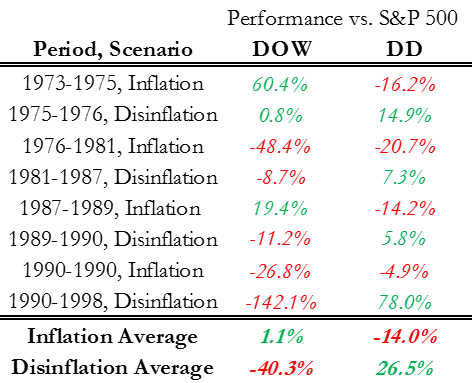 While the data is all over the place, and we have to go back a long way to get the data, Dow has averaged better performance in inflationary environments than DuPont, while DuPont has performed well as inflation has declined. One problem with this analysis is that the companies have changed significantly since this period – DuPont in and out of oil/gas – both in and out of pharma – DuPont into seeds – Dow acquired Rohm and Haas etc…. We are not sure we can read much into this data. Should the deal break because of any EU ruling or otherwise we believe that leadership would play a major role in stock performance immediately. The relatively new DuPont CEO, Ed Breen is held in high regard by pretty much everyone; DuPont employees, Dow employees, past colleagues and investors. He is expected to stay after the merger and he is likely to be given the benefit of the doubt by investors regarding what can be made of DuPont if the deal breaks, especially given his record at Tyco. The CEO of Dow, Andrew Liveris, has announced that he is retiring by June of 2017. Andrew has been CEO of Dow since 2004 – 12 years – much longer than the Dow tradition of 5 year terms. While there are several qualified successors, the merger has not required that one be anointed. A break of the deal would require almost immediate announcement of who would take the helm and what a solo strategy might look like. Dow does not have the cost related upside that DuPont has and is a more complex and unlikely break-up story. Dow may have a fantastic five or six-year commodity run in front of it, given low cost exposure to a fast-growing polyethylene market. However, today, on a stand-alone basis it is not nearly as cheap as LYB or WLK, both of which are more levered to polyethylene on a pounds per share basis.